What a lovely family picture <3 A little too much of pale blue outfits but overall very harmonic picture. Next year there will be 14 people. They are into this coordinating thing, aren't they? That said, this is a beautiful photograph and I think the pale blue works really well - there is a great summery feel to this. Well, Madeleine and Sofia are not pale blue! Yes, I realise that. Your point is? 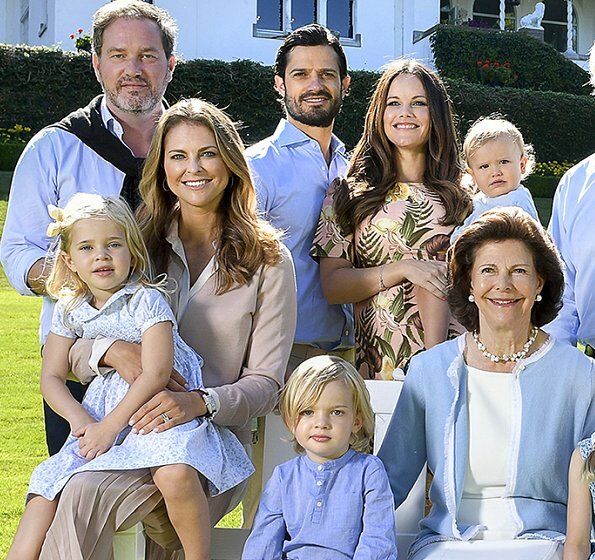 I'm sooo grateful that Madeleine and Sofia are not pale blue. They bring some other color into the picture, yet, their outfits match perfectly with the overall "pale blue" theme. It might have looked nicer if Victoria had worn something combining the pale blue and beige colours. Lovely photo, and all the kids are looking at the camera! Nicholas is the spitting image of his father, but I do think he would look better with shorter hair. Was there a big sale on blue shirts and dresses in Sweden lately? Lovely family, but this much coordination makes them look like they are wearing an uniform and are regimentally dressed. Begs the question if they are allowed to have any personality. The only answer I get is 'nope'. It's one thing to dress little kids to some extent in coordinating looks, but this (to me) is borderline ridiculous. Maybe they were also posing for a comic book (that is not meant in an offensive manner, just trying to find a justification). Jokes aside, they put out a good image, and are one of my favourite royal families. They just need a better image consultant. Très jolie photo. J'aime beaucoup l'harmonie des couleurs pastelles. When people worry about Prince Oscar rarely smiling, take a look at his grandfather, the king. Do you see many photos of his smile (if he has one)? One son-in-law rarely looks happy, either. But it is a nice grouping, harmonious color, and it looks like a super lawn for children to roll down. You make a good observation in connecting the King and Oscar, K Hass. I have been concerned that Oscar is such a solemn little boy and,unlike his sister,never smiles and always looks serious in photo after photo. The King also seldom has a smile on his face and is almost always in a serious mode. This photo is a beautiful portrayal and so well done. I do like the color coordination. Hach, wie schön, das alljährliche Familien/Sommerfoto. Ich mag es, dass sie sich für eine Farbe entschieden haben - machen wir manchmal auch so, wenn die Sippe zusammen ist (family identity sozusagen. Blautöne haben wir auch schon mal gewählt, einfach, weil fast jeder etwas in dieser Farbe hat). Also, ich mag diesen klassisch-frischen Sommerlook. Die Mädchen strahlen und die Jungs gucken ein bisschen ernster aus ihrer blauen Wäsche. Oscar ist genial: ich habe den Eindruck, er hat sich schon als ganz kleiner Knirps dazu entschlossen, es uns allen zu zeigen;-) Schöne Ferien, liebe königlich-schwedische Familie! Little Alexander has the cutest puzzled look on his face! Like the pale summer blues--beautiful family. I like the photo so informal, and yes Gabriella, I agree with you and other, I wish Nicholas, and Madeleine + Sofia can get a haircut! Looks like Madeline and Sophia did not get the memo about the blue shirts. They all look great however. I don't know. My first thought was: the most popular member of the family, the crownprincess Victoria, fits in. The other ones, neither crownprincess nor married to a crownprince, need to draw attention to themselves. If the point is not to draw attention to themselfs why are they dressed diferently? That makes them stand out not the opposite. If they weare blues they would blend with the rest of the family. In that case they are drawing attention by being in a different color. Actually when a photographer sends color code wishes, there is never just pale blue, it is mixed with beige etc. Here I would have liked to see less blue myself. 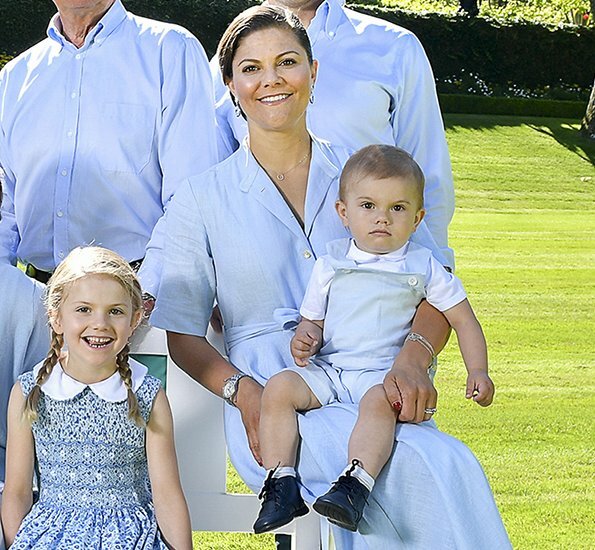 Lovely photo, however I think it is a shame that neither Madeleine or Sofia opted to wear pale blue. 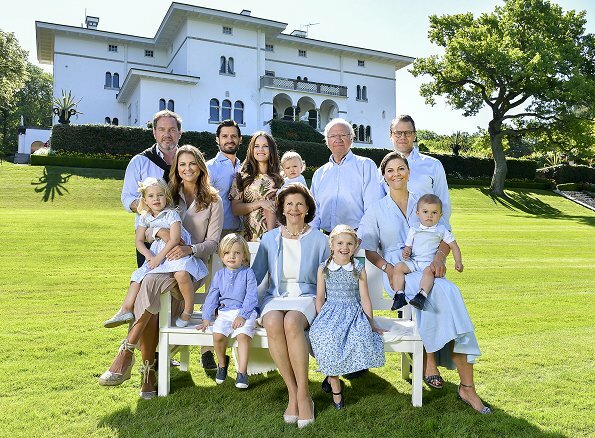 To me it seems as though they are drawing attention to themselves, whilst Queen Silvia and Victoria looks stunning as does the ever gorgeous Estelle. Lovely family picture. I don't like most wear light blue it looks like a school uniform, maybe different blue tones might be better, Madeleine and Silvia show more personality. The children are very cute all of them, but Oscar has the same expression in all pictures I've seen of him, serious face, not smiling, no spark in his eyes.